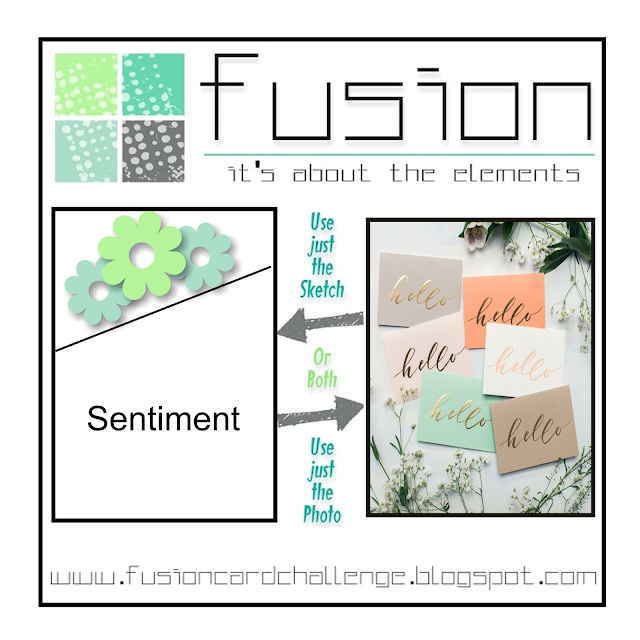 Welcome to another fabulous Fusion challenge! Today we've gone with an elegant, soft-shaded inspiration photo and a fun sketch featuring an angled panel. I created a fusion with my card to come up with this. I decided it was high-time I got out my Zig markers so chose to do a bit of watercoloring of this gorgeous Mondo Hydrangea flower and leaf, which I white embossed onto Bristol Smooth cardstock. Once they was colored and die-cut, I set them aside to work on the card base. I die-cut a curve from a panel of white cardstock and also a strip of gold foil cardstock. Layering the gold behind the white, I adhered both to a white top-folding card base with foam tape. I then added the hydrangea, using foam for the top portion and liquid glue for the bottom. The sentiment was die-cut from toner paper and gold-foiled and I finished the card with a solitary falling petal beside the sentiment. Thanks so much for visiting! 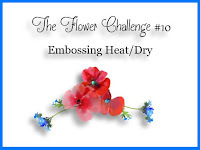 I'm linking this up to the current Flower Challenge, where they are asking for heat or dry embossing, and the Anything Goes challenge at Addicted to Stamps and More. gorgeous! LOVE that big ole hydrangea! This is what I call PERFECTION, Karren! 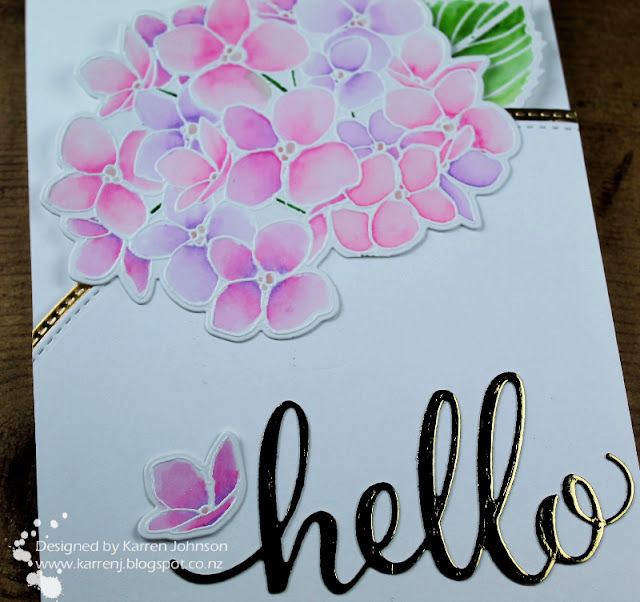 You did an amazing job coloring your Hydrangea with your Zig markers and I love your color palette! I also love that you chose gold foil for your border and sentiment! Such a gorgeous card!!! 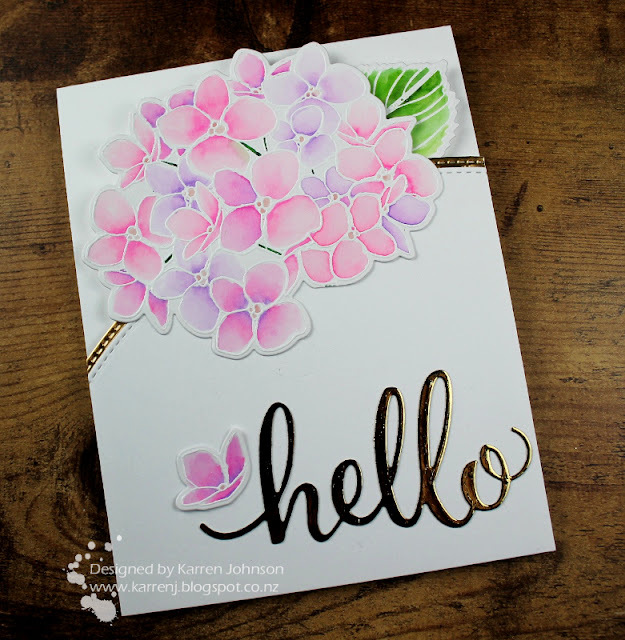 What a beautiful CAS card, Karren!!! The hydrangeas are beautifully colored and the added gold gives the design such elegance! I'm absolotley fan of gold and stunning about people who make a great job with marker. Hello gorgeous! 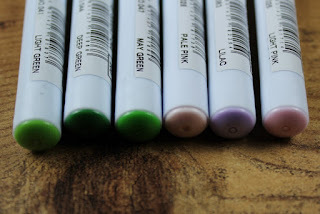 Your zig watercoloring is so soft and pretty! Beautiful card! This is so soft and beautiful Karren! I love the gorgeous colouring and the curved panel is a fabulous background with the golden trim. WOW those flowers are gorgeous Karren. Love the bit of gold. Your watercoloured hydrangeas are just divine, Karren. Such a beautiful card! Those hydrangeas are so pretty Karren - it doesn't seem to matter what inks I use, I can never achieve a soft look like that. 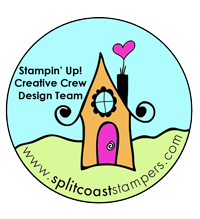 Love the touch of gold peeping out of the die cut edges! What a gorgeous card! Your coloring on your hydrangea is beautiful!